A mad scramble for a workable dressing promptly ensued. It had to be fast and incorporate very few ingredients, preferably all staples that we still had in the pantry. My husband found this one on MyRecipes.com and it worked out beautifully. It’s well-balanced between sweet and tart, pairing up well with the sweet asian pears and the bite of red onions. shredded Manchego, Pecorino Romano, ricotta salata, etc. Whisk together first 5 ingredients. Gradually whisk in oil until completely blended. Cover and refrigerate up to 3 days. OR Combine all ingredients in a vinaigrette shaker or a small sealable jar. Shake well until completely blended. 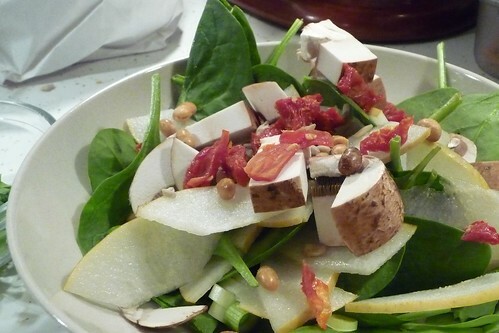 This entry was posted in american, dairy-free, gluten-free, recipes, salad, untranslated. Bookmark the permalink. I would like to try the Asian pear salad with some small strips of smoked duck or trout. Smoked salmon with maple is heavenly. Salmon might be too strong but trout may be milder with the pear. Maybe I’d throw in some jicama. Oooh, if that doesn’t sound good! Smoked trout with the pear would be marvelous.